Just a quick update on Christmas last weekend at our church. We had 8 services (normally we have 4) with an attendance above 3000 people! This is roughly twice the number of our normal weekend attendance!! Even better than that is there were 70 people who made eternally impacting spiritual decisions to follow Christ!! The Gospel was clearly presented, Christ was glorified. Thank you Pastors Phil Print and James Brown for your commitment to sharing the Good News at this time of year. Just posting an update on my progress in my exercise program. I joined Life Time Fitness in Woodbury, MN Oct. 31st. The first two weeks I did nothing but cardio. Week 3 I introduced some very light weightlifting. That first week of weight lifting I stayed at 135lbs on my bench just to work on form. The second week I put up 185lbs on bench but was shaky doing so. I was pretty close to my max at that point, which I honestly expected since it had been 6 years since I had last lifted. Tonight I decided to push things. 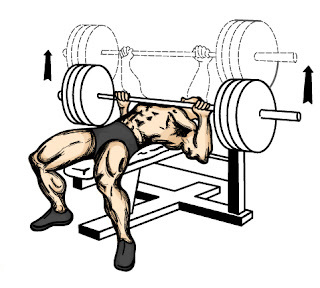 For the last two weeks I have been benching 225lbs as my final set, anywhere from 3-5 times. It really was all I could lift. Tonight I jumped up to 245lbs, and found it surprisingly easy to lift twice. So I put on 265 for my next round, and put that up, though admittedly barely at that point in my workout. Not nearly what I used to lift, but impressive (to me anyhow) considering how short of a period I have been lifting. As a point of reference, 6 years ago before enrolling in seminary I benched over 400lbs. I don't know the exact total of my bench max, as I had not maxed out for quite some time. My final working set of 5x5 bench was 395lbs. I did all this naturally, no andro, no bench shirt or anything of that sort. I also maxed my squat at 595lbs, and dead lifted 450lbs. My DL was always my weak point as I've had some minor lower back issues from time to time over the years. I always took my DL a bit easier than my other lifts because of this, and it held that development back. I enjoy lifting weights, and honestly wish I had more time to do it. There is something about moving large steel plates that really gets me going. Now if I could only get just as excited about cardio so I could speed along my weightloss. I manage 30-45 minutes of cardio 4-5 times a week, but I am hoping to begin increasing the intensity of those work outs. I'd like to get to the point where I could play some pick-up basketball at the gym, but right now that is still a little ways off. I'd do fine in half court, but running full court I'm not sure how long I'd last. Oh to be young again! I have started reading a new(er) book by Thom S. Rainer and Eric Geiger called "Simple Church". So far I'm really liking it, with the caveat that it hasn't covered a whole lot of new ground in the 25 or so pages I have read thus far. I'm looking forward to some time over the next week to dig further into this book. I also got an email today from Crossway Books that contained a link to my electronic copy of the new book by Mark Driscoll and Gerry Breshears titled Vintage Jesus. My print copy will be coming soon as well. I'm really looking forward to this book. I read a bit of the electronic copy already and it is vintage Driscoll. I hope it will be thought provoking and interesting. We'll be heading to Sioux Falls for Christmas, so hopefully the roads stay clear! It isn’t often that I send two E-News letters in the span of two weeks – and I promise not to make a habit of it – but what’s happened these last two weeks has shocked and humbled me. Some of you have been wondering about our December series and whether our prayers to reach people are being answered. Well, two weeks ago we saw an all-time non-holiday record of 11,289 people attend our three campuses, many of whom are new to our church. Then, I spent last weekend at our new campus in Spring Lake Park, where we opened up a third service on Saturday night… and 350 people came! Then I watched the two Sunday morning services fill up, and my jaw dropped. We had a total weekend attendance at SLP of 1306. This is unheard of by anyone’s standards. I don’t know of any other church that has that kind of immediate growth at a new multi-site campus. But what thrills us more than anything are the stories we’re starting to hear about people who weren’t thinking about God or faith a month or two ago, but are now taking steps toward a new life because the people of Eagle Brook were obedient to Jesus’ directive to sow seeds. My young car salesman and his wife have come all three weekends and he said, “It was the first time I’ve ever been in a church where I didn’t want it to end.” As I stood in the lobby at SLP last week I talked with dozens of people who thanked our church over and over for opening up in their area. So, way to go church, thank you for believing, praying and inviting; thanks for taking some risks, for sowing seeds and for making room for God to do something amazing among us. A word about Christmas Eve: We’ve been working on Christmas Eve for two months now and it’s going to be powerful! It’s not too late to invite someone, and if they come I promise that it will be a highlight for them and for you. Thanks to everyone that’s picked up tickets at church or online. Based on the trends, we anticipate that the 4 pm service on Monday in Lino Lakes and the 4 pm service on Monday in Spring Lake Park could get full. If you haven’t gotten tickets yet, and have the flexibility, please consider attending a service other than those two services. Again, if you haven’t gotten tickets, please reserve them online by going to www.eaglebrookchurch.com/etc/christmaseve/tickets.html. A word about year-end giving: I wish I didn’t have to mention this, but December is a critical month for most churches in America and Eagle Brook is no exception. Everything we do is funded by the generous contributions of thousands of people like you, and it’s vital that everyone does their part. We’ve stayed under budget in most areas for 2007, but it’s been a year of expansion and increasing influence for our church. Frankly, it’s put a strain on our resources that will affect future initiatives and badly needed hires. So, if Eagle Brook has been important to you in 2007 and you believe in what we’re doing now and for the future, please consider making Eagle Brook a priority in your giving. Many of you give faithfully and sacrificially, and for that we are deeply grateful – but it’s vital that all of us participate. Thanks for what you are doing at whatever level. Every contribution matters, no matter how big or small, and these last eight days are key. We appreciate your support! It is great to see so many good things happening at the Spring Lake Park campus. It is in a prime location, and I pray that God will continue to use that location to do great things! This past weekend Eagle Brook Church opened their third campus in the north metro area of Minneapolis and St. Paul. This third campus is in the building formerly known as Spring Lake Park Baptist Church (SLPBC) - a church I was on staff at for 3 years. This is an exciting move for SLPBC was really struggling over the past few years. The Spring Lake Park Campus of Eagle Brook Church opened with two services - one at 9:30am and one at 11:00am. In spite of a sizable snow storm the attendance for this opening was spectacular. 540 people at each service! 1080 people in all! Starting December 15th there will be an additional third service at 6:00pm Saturday night. This fantastic turn out created traffic problems, as the parking facilities of this location are somewhat limited (on site) and snow/weather added an unexpected element to complicate things. The joy of living in Minnesota! The Spring Lake Park Campus of Eagle Brook Church will have Steve Whicker serving as their campus pastor. As Campus Pastor, Steve will provide leadership and direction for this community, and will be the liaison between Spring Lake Park and the broader EBC family. I am glad to see that Eagle Brook chose to keep my friend Lynfield Hines on staff as the Student Ministries Pastor. It is also good to see the wisdom in keeping Dan Munson to minister to the older adults of the church. Eagle Brook Church is a growing, Christian church that is committed to reaching people for Christ, and bringing them into strong relationships with God and each other. It's their desire that all visitors—regardless of their faith background—be able to walk into any campus and be welcomed by real people, inspired by excellent music, and challenged by biblical messages that give answers to everyday problems. 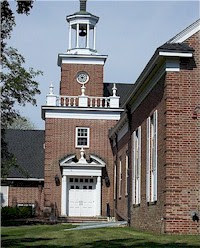 Eagle Brook—Spring Lake Park is one of three church campuses. It offers the opportunity to share in all of the resources, programming, and excellence of one of the largest churches in the five-state area, while experiencing the intimacy and community of a small church setting. At the Spring Lake Park Campus, weekend services feature live worship from an in-house worship band, as well as the leadership and guidance of an on-site campus pastor. Each weekend's message (sermon) is presented via video by either the senior pastor or one of Eagle Brook's teaching pastors on large, state-of-the-art screens. This allows consistent, excellent teaching to be presented across all the sites on the same weekend. If you would like to see a sample of some of their past teachings, visit the Past Messages portion of EBC's site. Dynamic, age-appropriate kids programming is available during all services for kids from birth-grade 5. Click on birth-K or grades 1-5 to learn more. For a while now, I have had in the side bar of this blog four of my bedrock beliefs. Recently a friend asked me about #4 - It is a sin to bore people with Jesus. I'll do my best to try to explain my thinking on that one. God is the creator of all things. We have a God that exceeds explanation. Within that creativity we find nothing that should bring us boredom, especially not when it come to talking about His perfect son, Jesus Christ. As Christians we are called to glorify and honor Christ. If we make Christ boring, if we do not use our God given creativity we dishonor Him. Following Christ is anything but boring if we follow Him as He calls us to. It is dangerous. It is full of risks and challenges. It is to live in a way that is different than our surrounding culture. It makes us aliens among men. 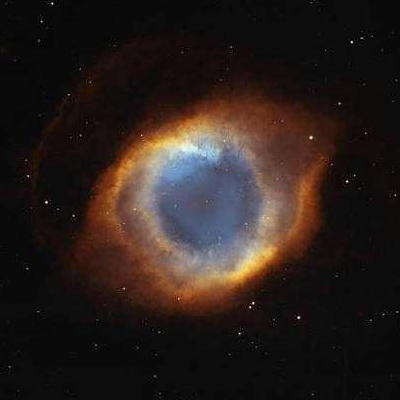 So making Christ boring, not utilizing all that we are gifted with, is short changing the ultimate Creator. Pursue Christ passionately. Share Him with joy and creativity! Below is the recipe that I used for my Thanksgiving stuffing. For the record, everybody loved the stuffing. I'll be sending the recipe to my mother-in-law and sister-in-law. I cooked a 14lb bird, and put the extra stuffing in a separate pan in the oven. Always cool the stuffing completely before filling the turkey. Makes 10 cups of stuffing, enough for an 18-pound turkey. Brown the sausage in a pan, breaking up clumps; remove to a large bowl. Add the oil to the pan; stir in the onions, celery, garlic, thyme, and sage and cook over medium-low heat for 15 minutes. Add to the sausage along with the bread, apples and dried fruits. Toss well. Drizzle the broth over the mixture to moisten as desired and season with salt and pepper. Cool before stuffing the turkey. On Halloween day, my wife and I joined Life Time Fitness. I have been diligently working out 5 days a week since that point. I have focused on cardio, doing 30-60 minutes a day of recumbent bike and elliptical. I often warm up and cool down on a treadmill as well. Tonight I did 30 minutes of recumbent and 12 minutes on the elliptical, and then hit the weight room. I have been lifting fairly light weights the past few weeks working on form. Tonight I moved on to some heavier weights (nothing really heavy honestly, just in comparison) and I felt amazingly strong. When I last lifted with regularity, I had maxed my bench press working weights at 395lbs (I hadn't maxed yet on that program, but I know I could bench 435 naturally for sure). That was November 2002. Since then I have gotten weak and flabby while strengthening my mind in Seminary. Tonight I did reps with 185 - 3X10. It will be interesting to see over the next few weeks how my body responds to lifting. I am naturally inclined to moving heavy things. I'm a big guy by any measurement. Additionally, I actually enjoy lifting heavy things. So we'll see how things go. I know my testosterone levels are lower than they were 5 years ago (part of the aging process) though I suspect they are still high enough to get good gains. The thing that different for me now is that I'm doing cardio like never before. Cardio was a swear word in my mind. I would play basketball or something, but never intentionally work my conditioning. So from time to time I might post on how I am doing. We'll see what kind of body transformation I can enact. I will say I am already feeling a lot better. I can go longer and harder during my cardio sessions. I am sleeping better. I feel like I have more energy at the end of the day than before. So far so good! Tomorrow I will be preaching again at Colony Park Church of Edina. I'll be preaching from 2 Timothy 3:16, and feel I have a pretty good sermon. I need to run through it a few more times, but I think I know it pretty well. I am enjoying these opportunities to preach from time to time, and would like to find a way to make it more consistent. I have been applying for ministry positions, but seem to not quite have what everyone wants that I have spoken with. I'll make it past the initial screening, but can't make it into the interview process. It is frustrating, but I know God has a plan so I'm trying to remain patient. We joined Lifetime Fitness on Halloween day. I've been hitting the gym hard since then, and am already noticing some improvements in the way I feel and how long I can do cardio. I have a lot of work ahead of me, but in time I will see some body transformation. 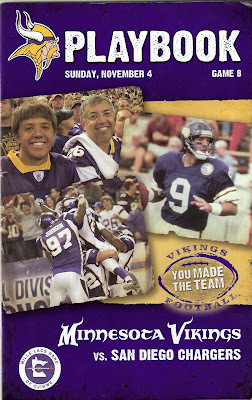 Earlier this week I had a co-worker offer me two tickets to today's football game between the Vikings and Chargers. He was asking roughly 1/3 of face valued, and after a quick consultation with my wife I made the purchase. Oh how happy I am of that purchase! Today we saw Adrian Peterson singlehandedly DESTROY the Chargers. Peterson rushed for an NFL single game record of 296 yards on 30 carries. He had 3 touchdowns along the way as well. Perhaps most amazing is the fact Peterson gained 253 of those yards in the 2nd half! We also saw the longest return in NFL history to close the first half. Ryan Longwell came up short on a 57 yard field goal attempt, and Antonio Cromartie grabbed the ball just inches from the end zone line. Cromartie proceeded the length of the field, untouched, to score a touchdown. A big swing in the score, and a big swing in apparent momentum going into half time. The crowd was less than inspiring the first half of the game, but by the end of the game it was fan fueled frenzy! Disclaimer: The following books comprise a brief list of resources that we have found helpful for our church planters. In endorsing each of these books we are not saying that we agree on every point, but rather find the book as a whole helpful. Some of the authors that our planters gravitate toward include members of our Acts 29 board such as Mark Driscoll and Ed Stetzer, along with current writers such as Ravi Zacharias, Tim Keller, John Piper, DA Carson, Wayne Grudem, Bruce Ware, Leon Morris, Alister McGrath, and John Frame. A previous generation of writers we like includes Francis Schaeffer, JI Packer, and John Stott. We also like a lot of dead guys, including the Puritans. I mentioned I had lunch with Dr. John Piper (and a collection of other pastors) last week. Today he has posted his notes from his presentation. There is also a link to the audio. I really recommend that you give this a listen. Valuing Biblical Manhood Audio (click to download). Below are John Piper's notes that he spoke from. Thank you Dr. Piper for your leadership on this subject. The theology and the church and the mission are marked by over-arching male leadership and an ethos of tender-hearted strength and contrite courage and risk-taking decisiveness and readiness to sacrifice to protect and provide for the community—the feel of a great, majestic God making the men lovingly strong and the women intelligently secure. 3. Women are more properly drawn to a Christian life that highlights the proper place of humble, strong, spiritual men in leadership. This more properly feels freeing and safe. It feels like a place where the men in her life might learn to take initiative without being domineering. 4. We are freed to celebrate strong, courageous women of God who love the biblical vision complementarity, without and sense of compromise. The men are so clearly strong and secure in their leadership that they are not threatened by women who are spiritually mature and effective in ministry. 5. Men are awakened to their responsibilities at home to lead the family and protect the family and provide for the family. A clear definition of manhood helps a man take responsibility. 8. The corporate worship teams are not dominated by women and the songs chosen are not dominated by a one-sided feel of intimacy or majesty. The presence of masculine men and strong theology and music give the corporate worship a feel of strength that helps men discover and express the fullness of the emotions toward God that God calls for. 9. The God of the Bible will be more fully portrayed and known than where the tone is more feminine. The God of the Bible is overwhelmingly powerful and authoritative and often violent. He is Lord and King and Master and Sovereign and Father and Ruler. His tenderness and gentleness and patience shine in their beauty because of appearing in this dominant light. Women need an ethos of this kind so that they can relax and be more of their nurturing selves without fearing that they must work to create the ethos of God’s grandeur lest it be lost because the men are not speaking it and modeling it. 10. Preaching is more readily prized. Preaching is “expository exultation”—a forceful acclamation of the greatness of God and a passionate appeal for full-blooded response to him. The fear of strong preaching is part of the effeminizing of the church, and the full range of the way God is and appears on the Bible is not known where preaching is simply casual and conversational. 11. A wartime mindset and a wartime lifestyle will feel more natural. And that is what the world needs from us—a readiness to lay our lives down for a great and global cause making all the sacrifices necessary to push the word of Christ into the most inhospitable places. 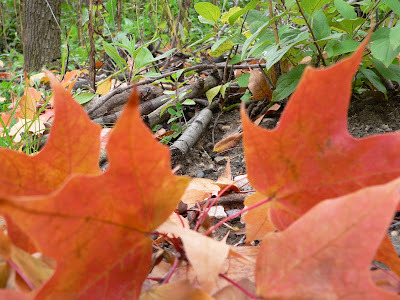 So often we religious people walk amid the beauty and bounty of nature and we talk nonstop. We miss the panorama of color and sound and smell. We might as well have remained inside our closed, artificially lit living rooms. Nature's lessons are lost and the opportunity to be wrapped in silent wonder before the God of creation pass us by. We fail to be stretched by the magnificence of our world that is saturated with grace and beauty. Dr. John Piper - "Some Sweet Blessings of Masculine Christianity"
I had lunch with Dr. John Piper today. He sat next to me and we discussed how meal groups operate at CrossRoads Church. He was a gracious listener and briefly shared his passion for how small groups are great tools for connecting people in Christian community. Following lunch, Dr. Piper gave a message to 45 of us titled "Some Sweet Blessings of Masculine Christianity". The session was recorded, and will be available on Desiring God's web site soon. I'll link to it when it become available. Below are my notes from this message. There was a period of follow up questions that were very insightful. The very last question of the day (if it was recorded) was by me asking Dr. Piper to share his thought on how there has been some progress made in churches across the country in regards to complimentarian issues via groups like Bethlehem Baptist, Desiring God Ministries, Sovereign Grace Ministries, and the Acts 29 Network, but that there has been little progress made in academic circles. Dr. Piper specifically lamented how this has played out at Bethel Seminary. A very interesting and passionate response. 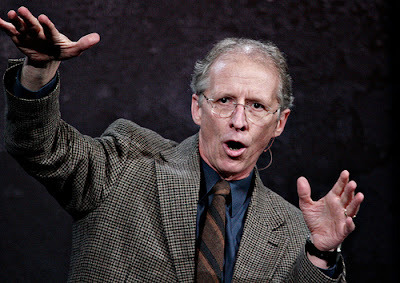 In one of the more humorous moments of the afternoon, Dr. Piper tried to avoid saying he doesn't like girly-men leading worship songs, to then only say it anyhow. It was rather funny! My note are pretty good, though in spots Dr. Piper was too interesting and engaging for me to remember to write things down, or he spoke too quickly for me to keep up. Hopefully when I listen to it again I'll catch everything I missed writing down. This is a message I really think Mark Driscoll would have enjoyed hearing. "Some Sweet Blessings of Masculine Christianity"
-The foundations are all some key verses in understanding Dr. Piper's views on Complementarity. -The role and influence that TV and movies play in our culture is significant because a person could not find a biblical world view from them. They are also not governed by a biblical world view. -Without a father, navigating the role of manhood is nearly impossible for young men. Dr. Piper then gave 11 Sweet Blessings from Masculine Christianity. 1)...men are finally freed to have feminine traits without fear (and women are freed to have masculine traits as well). 2)...men are more properly attracted to the Christian life when they don't have to be effeminate. 3)...womn are more properly drawn to the Christian life (because they feel it is a safe environment for them to be who God created her to be, and that they will be encouraged to live out who they were created to be). -Dr. Piper noted that carnal men and women don't like God's order here. 6)...youth leaders and parents will be able to answer what it means to grow up as a man and not as a woman, and as a woman and not as a man. 7)...the meaning of masculinity and femininity will be clearer in singleness and a life lived out in celibacy, making celibacy more livable in our sexually skewed world. 8)...the corporate worship teas are not dominated by women, the songs chosen are strong and not effeminate. -we need to be warriors for Christ charging the gates of Hell. We must fight a strong enemy with strength. This was followed by the Q&A session. A fantastic afternoon, and hopefully audio will have turned out well so that everyone else can listen to this message. Fidelis Foundation was a great host for this, and I appreciate Bethlehem Baptist Church for opening their doors to allow this to happen. This afternoon over lunch I have the opportunity to sit at Dr. John Piper's feet at Bethlehem Baptist Church and learn from him (along with a few other local pastors). I am really looking forward to it. This is a service provided by the Fidelis Foundation to some local pastors, and I am greatly appreciative of it. We get together roughly quarterly for lunch and discuss things related to Biblical Manhood and Womanhood. This is where I first heard Dr. Wayne Grudem speak as well. I expect it will be a fairly intimate setting today, though there likely will be a lot more pastors in attendance than usually are. I've seen Dr. Piper preach a good number of times, but it always came in the context of his church, so it was me and a thousand or so other people, and in that setting I feel some of the nuances are lost. Today I will get to see his passion up close for the first time, and that is very interesting to me. He is undoubtedly a very passionate man of God. I pray that I too may grow to be this passionate about the local church and God's Word. This coming weekend (Oct. 21st) I will be preaching at Colony Park Church in Edina. Should be interesting and I am really looking forward to it. This church has gone through some turmoil recently, and I am filling a temporary gap for them. Edina is a fairly affluent suburb just Southeast of Minneapolis. The congregation is fairly small but committed from my understanding. Here are the results from your evaluation! Click on the name of any gift for a detailed description of the typical traits and characteristics associated with that gift. They are provided not as an exclusive description, but as a means of helping you better understand or confirm your spiritual gifts. If you feel that a particular category does not closely describe you, review the characteristics of your second spiritual gift; it may be a better match. Each gift score is out of a total possible of 12. So far so good, the conference has gone very well. I sat in on a great session this morning on the identification and cultivation of small group leaders. I will blog on it further at some point in the future, but it was simple yet brilliant. Today we have two break out sessions to start the day off, so we didn't to worship to start our day off. That is honestly a disappointment for me. I love getting together and singing, and it is especially cool to do so in Willow's sanctuary with thousands of other leaders. 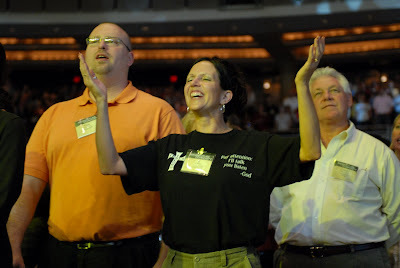 If you would like to know more about Willow Creek's Group Life Conference they have a lot of related resources over at the Willow Creek Group Life Community pages. I am now in break out session #2 where I will continue learning about finding and developing small group leaders through a process called "Liquid" from the guys from Mariners Church. Scot McKnight's session was very good yesterday. He effectively said the same things as he did at our Sanctuary service, but those who heard both were unanimous in their feeling that his presentation at our church was actually even better than his Willow presentation! We survived the drive to Chicago early this morning, through traffic, road construction and toll booths. I'll update this later, but wanted to point out that we (myself and a team member) made the cut and are shown on Willow Creek's Flickr account worshiping earlier this morning. It's time for dinner - we're heading to Max and Erma's. This is my first trip into Chicago, and my first experience at Willow Creek. So far so good! Later today, myself and 5 others from my church will all pile into a 15 passenger van (minus the back seat) and make the trek down to Willow Creek Community Church for the Ancient-Future Conference for small group ministries. Scot McKnight, Will Miller, Henry Cloud, Bill Donahue, Alan Hirsch, Ron Martoia, and Mark Buchanan are just a few of the many leaders who will be leading sessions. 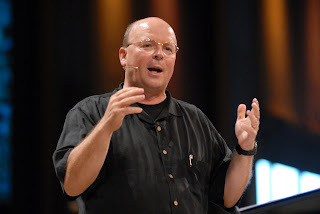 We actually had Scot McKnight flown into our church (Crossroads) this past weekend to help launch one part of our meal groups ministry for our Sanctuary service. I have never been to Willow Creek Community Church (or Chicago outside the airports for that matter) so I am excited to check things out. I have always attended the Leadership Summit at a satellite campus. One of our plans while in Chicago is to eat at Gino's Pizza. My mouth is already watering! We'll then make our way down to Navy Pier after filling ourselves with some of the best pizza on the planet. We launched our meal groups ministry this past weekend at Crossroads Church. It was a lot of work, but a great success. We doubled the number of people who are part of a small group in our church through this process. While we still have a good bit of room for growth in this area, it was a rousing success. Especially considering the accelerated pace at which everything had to be put together to get our meal group launch off the ground. We are now at roughly 40+% of our adults who attend Crossroads who are in a meal group! Ten Shekel Shirt Lyrics for "Great"
Below are the lyrics to the song Great by Ten Shekel Shirt. I really dig these guys. Ten Shekel Shirt is not currently making together, though their front man Lamont Hiebert has been doing some great stuff on his own if you want something that is pretty similar. He has a new album coming out in early 2008 called Jubilee that suspect will make its way into my CD player. In 2000, Canadian recording artist Lamont Hiebert wrote, recorded and co-produced the album Much. Before releasing the album Lamont recruited Austin Morrison (drums) and Tommy Lee (bass) and formed the band Ten Shekel Shirt. The independent release of that album sparked the attention of Integrity Music who then signed Lamont Hiebert as an artist under the moniker / band name of Ten Shekel Shirt. The debut album Much sold 130,000 units, was nominated for a Dove Award, featured the #1 hit "Ocean" and the top ten song "Meet With Me”. While recording the 2nd Ten Shekel Shirt album Risk, Lamont co-founded Justice for Children International. (JFCI is a public charity that works to abolish child slavery and restore survivors.) Although the album Risk received rave reviews after its release in 2003 Lamont was torn between his music career and the abolitionist organization he started. “Unfortunately there is only so much time in a day. I was the Executive Director for a growing international charity and a front man for a successful rock band. From 2003 – 2006, I had to put my music career aside for the most part in order to focus on the organization,” Lamont recalls. Now with effective staff and offices for Justice for Children International in New Haven, CT and in the Philippines, Lamont is able to re-launch his music career guilt free. So what happens when an artist turns abolitionist turns artist? You get some intense songs about pain, suffering, rescue and restoration. There is an extremely high level of authenticity that comes through in Lamont’s writing because of his work off stage. This isn’t a guy who is merely another spokesperson for a cause, Lamont stepped off the sidelines and onto the field that is the modern-day abolition movement. Lamont has finished recording his much anticipated new album Jubilee and is set to release it in early 2008. He is convinced this is his best work yet. The line up of musicians has changed and the sound has evolved but the authentic presence of faith, justice and melodic rock remains. Shaved head - my wife hates my new hair cut! Yesterday I shaved my head. It wasn't supposed to be this short, but now it is. I started with a #3 on my whole head (leaving my bangs a bit longer than a #4) with my wife shaving the back of my head to make it easier on me. I then meant to do a #2 up the sides of my head, but grabbed the #1 by accident. One stripe up the side of my head made it obvious that #1 is really, REALLY short. It was a commitment cut. I called to my wife from the bathroom "My hair is going to be really short." Her response was "Ok." She had no idea just how short. 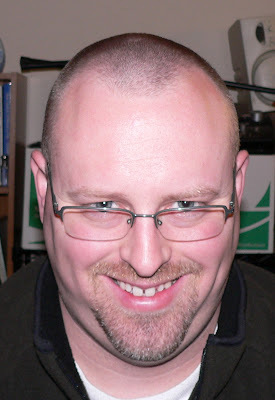 To balance it out some, I shaved my goatee short as well. With a forehead this big, I'm contemplating selling advertisements. A funny, and possibly painful commentary on Emergent/Evangelical/Fundamentalist differences in the Church today. This comes from Faithmaps blog. We have already begun work on Summit 08 and are committed to putting together the best speakers and programming elements we possibly can. We know from past experience the earlier we start the better the final result and have already confirmed Craig Groeschel of Lifechurch.tv and Gary Haugen of the International Justice Mission to the faculty. Here's a good one to bookmark because sooner or later you'll want to send it to someone: John Piper presents the gospel in 6 minutes. Branding actually goes much deeper than design and marketing and is a representation of the unique personality of your church. It should take into account your church’s calling, strengths, and core values. In fact, your church’s brand should be communicated at every touch point your with your congregation and community. Why would someone who is unchurched want toÂ attend your church? I received some good news in my inbox today. At the Wednesday night meeting of the Woodbury Planning Commission, our relocation project (the applications we've made to build and develop the land) got unanimously approved! Yea, God! Now, it all goes to next Wednesday night's meeting of the Woodbury City Council for final approval. Are we expecting more good news? Absolutely. The Woodbury City Planners are on board and the City Council pretty much approves whatever they recommend. Following next week's meeting we will apply for a building permit and be off and running. We still hope to break ground in a month or so. Continue to pray for the process. Pray for God's favor next Wednesday and also for favor as we negotiate what's called a 'developer agreement' (a fee we'll have to pay to develop and build). This fee could cripple us or just wound us depending on how gracious the City Planners are. Pray for good negotiations (we're a non-profit church not a developer who will be making lots of money on the property). This is great news. Things have been stalled for far too long on this project due to some indecisiveness on the part of the Woodbury, MN city council. It has kept our church's direction hanging in the balance. We didn't want to abandon our goal of building this year, but we also didn't want to waste time pursuing that goal if we were going to have to wait 2 years to build. Our church is simply bursting at the seams, which is a good thing. But if you've studied church growth at all you know that a "full" church is not welcoming to visitors. While we have grown as a church, I believe it has been at a stunted rate because we do not have open seats at optimum hours. So this is exciting and very good news!